Siargao Island, a province of Surigao del Norte known as the "Surfing Capital of the Philippines", has got surfers hooked with its superb year-round waves and chill vibes. But there's actually more to Siargao than the waves -- the reason why it has totally stolen the spotlight. More and more celebrities and other tourists from around the world are being captivated by Siargao's beauty. When will you be? #1 - World-class surfing: Consistently on any list of the world's best surfing places in the world, Cloud 9 in Siargao is certainly every surfer's haven. It hosts international surfing competitions and is a home to some of the world champions. Aside from Cloud 9 in General Luna, Siargao has a slew of other surfing spots also in the towns of Pilar and San Isidro that can quench the adrenaline thirst of experts and beginners alike. #2 - Breathtaking beaches: Siargao doesn't only have wild surfing shores, it also has some of the best serene castaway beaches. Nearby islands like Naked Island, an empty piece of paradise, Guyam Island, a little tropical heaven, and Daku Island, the biggest among the three, are all blessed with pristine white sand and clear water. What's best is that it is not overcrowded -- definitely your dream getaway. #3 - Enchanting natural pools: No words can suffice how beautiful the lagoons in Siargao are. Located in a remote area about 1 hour ride from General Luna is Sugba Lagoon, a perfect spot for a swim. It is a natural wonder with glowing jade green water surrounded by lush mangrove and rock formations. In Pilar, a tidepool that is hidden at high tide and revealed at low tide also offers a refreshing swim. The peculiar rock formation of Magpupungko with a bigger rock "sitting" on top of a smaller rock is a sight to behold too. #4 - Genuine and lovely locals: The people of Siargao are some of the friendliest people you could know of. The children would sincerely wave and smile at tourists passing by. Ask the locals where to go and most of the time, they would even gladly accompany you. They definitely add up to the laidback and homey feel of the island. #5 - Great food: The thriving marine life on the island is very evident from the freshly caught crabs, lobsters, squids, fishes -- practically any seafood you can think of! And you can get it at reasonable prices. There are also delicacies unique to the place, such as Pan de Surf or a bread shaped like a surfing board and crunchy biko or sweet rice cake. The buko pie in Dapa's Public Market is also a must-try. #6 - Amazing caves: One of the secrets of Siargao is Tayangban Cave. The experience involves about 15 minutes of climbing rocks and swimming through the darkness. You'll need a local guide to accompany you here. A huge archway at the end of the cave welcomes to a stunning open cave pool with clear turquoise waters and an 18-ft cliff dive spot. 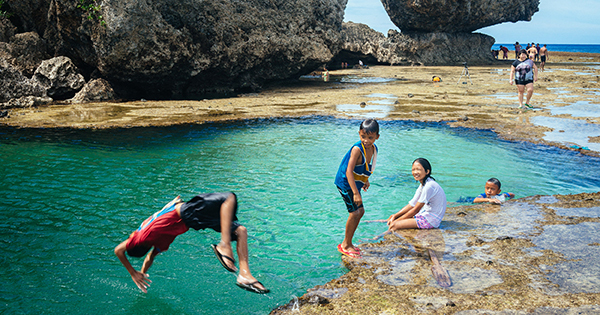 #7 - Sustainable tourism: What makes Siargao maintain its natural beauty is the joint efforts of the locals, the government, and most importantly, the tourists. Let's keep Siargao that way -- immaculate and unharmed. Leave nothing but footprints, take nothing but memories.